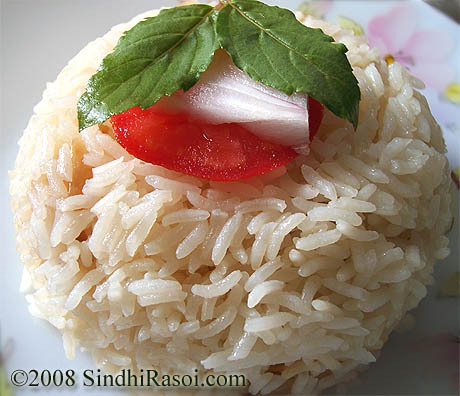 As many of you know, that Sindhirasoi is a blog about Vegetarian Recipes, so I thought to share something related to it. No, I am not here to convince you to turn Vegetarian in case you are a voracious meat eater or the one who can’t live without having chicken based dish.I am not here to force you to give up your daily dose of proteins in form of eggs, nor am I trying to bombard you with the information of “Cruelty against animals and birds”.We all know about the pros and cons of being “carnivores” and still if many of us opt for the same, its just a personal choice. Let’s leave aside the arguments of what’s good and what’s bad, for some other day.Right now I am here to request you to at least give up your love for meat for ONE SINGLE DAY….and here is the reason…..
On November 25, every year, “Meatless Day” is observed by many Sindhi and Non-Sindhi Followers of Dada Vasawani. To many thousands around the world, Sadhu T.L. Vaswani is a name synonymous with reverence for all life. Indeed, he was the living embodiment of an unsullied love that knew no bounds, an all-embracing love that included all mankind, animals and all creation. He cared deeply about the birds of the air and the animals of the earth; and he protected them whenever and however he could. Born on November 25, 1879, in Hyderabad Sind, Sadhu Vaswani’s life was touched with a spark of divinity from a very early age. After a brilliant academic career culminating in the M.A.degree, his natural inclination lay in following the life of a fakir. But this was not consistent with the wishes of his mother. So he submitted to her will and pursued a teaching career, becoming a professor and principal of prestigious colleges in the country. Sadhu Vaswani belonged to a time when patriotism manifested itself as a struggle for freedom from the colonial yoke. He was a freedom fighter and worked as a close associate of Mahatma Gandhi in the Satyagraha Movement. Implanted deep in Sadhu Vaswani’s heart was reverence for an life. Every little thing he did was inspired by the Vision Cosmic. His heart bled at the cruelties inflicted upon animals day after day, for food. “Take my head,” he pleaded,” but pray stop all slaughter!t’ This deep awareness of the need for reverence for all life, in whichever form it is manifest, formed a very essential part of Sadhu Vaswani’s teachings and has been propagated by the International Meatless Day Campaign. In 1986, it was proposed that November 25, Sadhu Vaswani’s Birthday be celebrated as an International Meatless Day. The campaign has met with considerable success in that, lakhs of individuals send their pledges to the Mission to go meatless on this day. Four state governments in India – Maharashtra, Gujarat, Karnataka and Andhra Pradesh – have issued instructions for the closure of slaughter-houses as well as butchers’ shops on 25th November every year, in their respective states. So are you willing to join the mission this year? All you have to do is pledge that you will turn vegetarian for a day , on 25th of November. Care to leave a comment at the end of post, pledging that you wont eat meat on 25 th of this month? If yes, then kindly accept my heartfelt gratitude ! 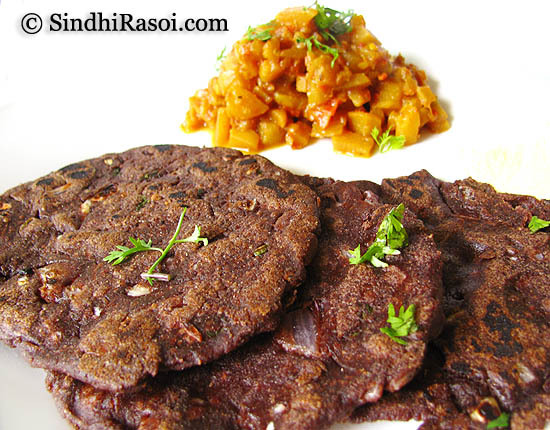 Now coming to the recipe of the day, Doda for sindhis or Joladda roti or Akki roti for others is well known unleavened flatbread made from rice flour or sorghum flour. This time I tried the same recipe with Ragi (finger millet) flour, ofcourse after I came to know the tremendous benefits of same. A REMINDER AT THE END, I AM PLEDGING FOR A MEATLESS DAY ON 25 th OF NOVEMBER….ARE YOU WITH ME ???? Chopped Green chillies as per your taste. Chopped fresh green garlic, a little,but use both…. the while bulb part as well as the green leaves. You can also use some crushed garlic cloves in case fresh garlic is not available. Oil 1 tspn for each dodo and some to add while cooking. Now add hot water little by little, mixing it properly and knead the dough,till you get a soft manageable dough.Smooth-en it properly by greasing your palms. Now take a small portion of this dough and pat it gently on your palms, till small puri like discs are obtained. (you can grease or wet your palms before doing so,to avoid sticky mess). Now this could be really tough for novices. Just try it this way…..Take a clean plastic sheet(or cut open a poly bag,or zip-lock pouch), sprinkle some dry flour on that and start patting the dough in circular motion till it achieves required thickness. Then carefully transfer it on griddle, let it cook for few seconds and slide it on the inverted flat plate, then transfer it back on griddle ( this is to help flip) and cook on other side. Enjoy it hot (it only taste good when hot) with any veggie / dal / buttermilk. 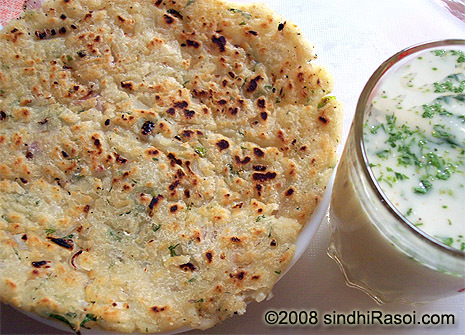 We enjoyed it with Turnip veggie, called Chithyal ghogrunh or mashed turnips. 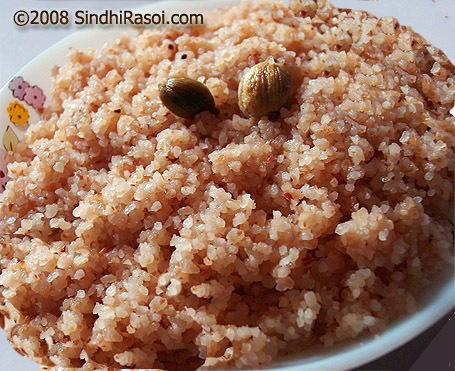 where to get ragi grain and ragi flour in delhi? Yes I am with you, no Eggs tomorrow. By the way I have walked in the parade which takes place on the 25th of November for many years. And thanks for refreshing my memory. I will be on a strict vegetraian diet on the 25th. Sounds delicious!! 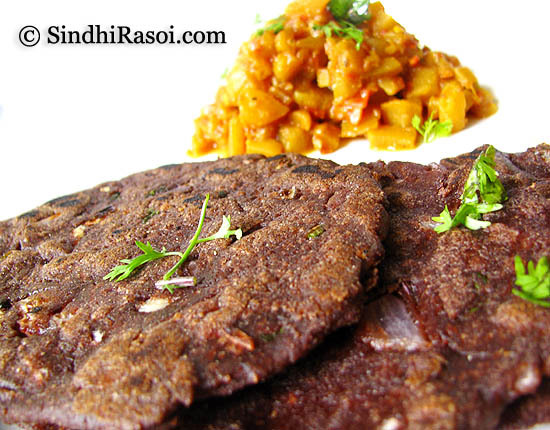 I love adding Ragi to meals – its tasty and nutritious too.